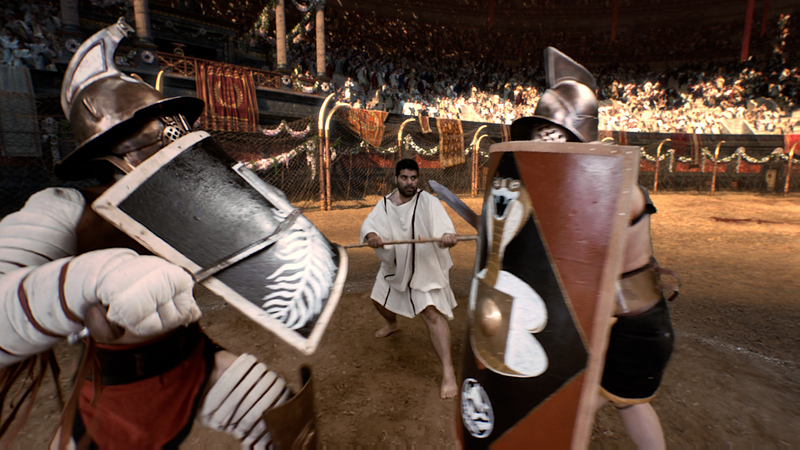 After completing the purely digital VR project “Volcanos”, the largest hurdle with “Gladiators in the Colosseum” was the integration of film footage into the VR space. Nothing about this project was comfortable or ordinary, everything was new, had to be concipated, or re-thought. 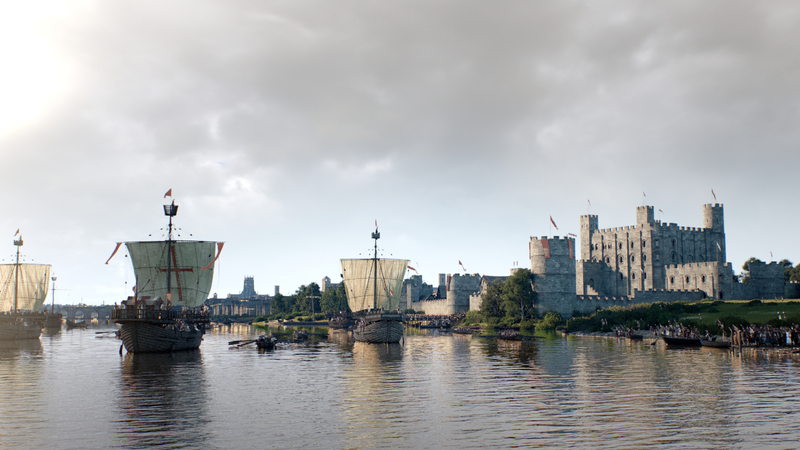 The digital computer sets were created later: meticulously matching the footage. Through months of work, models of Rome and the interior of the Colosseum were created in a never before seen level of detail. 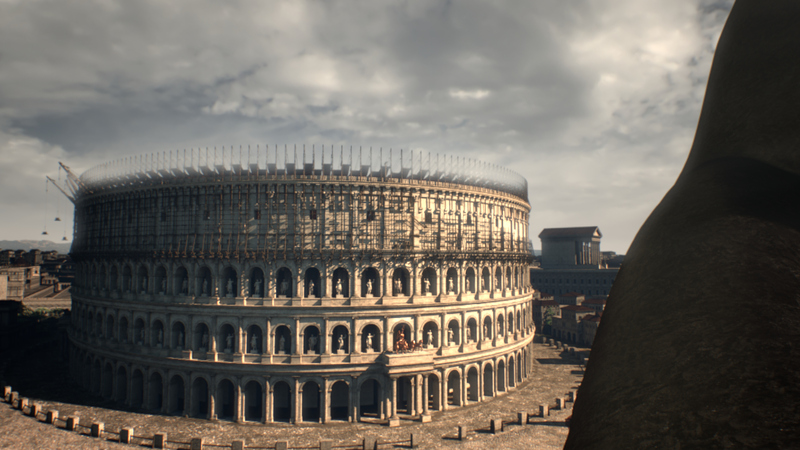 A secondary bonus: during the reconstruction of the 3D model of the Colosseum, an entirely new way of understanding the construction and function of the massive sun sails was imagined. To maximize the stereo 3D effect and get as close to the actors as physically possible, a camera system was developed that could imitate human perception. This system sees the entirety of the surrounding real-world space in the same way a human with two eyes would. This means that the complete film set was translated into the VR space with precise accuracy down to each pixel. The position of every object, actor and action had to be accurately measured and positioned exactly so that both sets were mirror realities of each other. Before beginning any film shootings, the mandate was to find solutions for diverse problems of human perception in the virtual space. Questions had to be answered, like “How do I steer viewer’s gaze” and “Will the viewer be watching the film in a standing or seated pose?”. Many things that wouldn’t need to be considered for classical cinema were posing considerable challenges in VR film making. An example of this would be the different experience for the viewer when viewing a mighty gladiator while standing, to the small dwarf that the same gladiator shrinks to when the viewer observes him while seated. After much research, an intermediate height was decided upon for the camera. This was a compromise to accommodate both standing and seated viewing experiences. Just as in the reconstruction of the digital Colosseum, the historical accuracy in the costumes and set was very important to us. 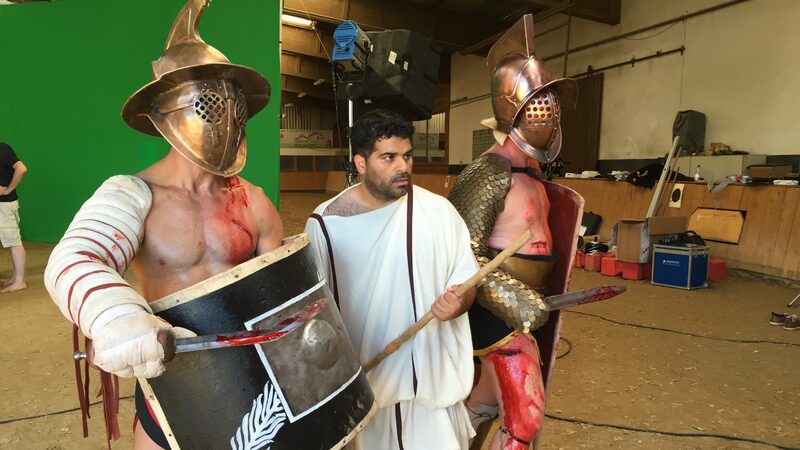 This was made possible through a collaboration with a group that lives the military and civilian customs of Roman culture through experimental archaeology. During the film shootings the emperor and senators alike wore extravagant togas with a surface area of up to 15 square meters and carefully constructed cloth draping. Where does one obtain gladiators with battle experience? After a long search, a school of gladiators was found as the best-possible representation of experienced fighters in this extremely specific discipline. This choice was accredited one-hundred fold in the following shootings – this was the perfect group for the job. Both gladiators approached their battle with unmatched precision and intensity, to the point where it became a repeating theme to see one of them reeling on the ground unconscious. The gladiator fights where filmed in a riding range. The sandy ground is indispensable to the gladiator. Either the sand comes into the studio, or the greenscreen had to come to the riding range with the sand. 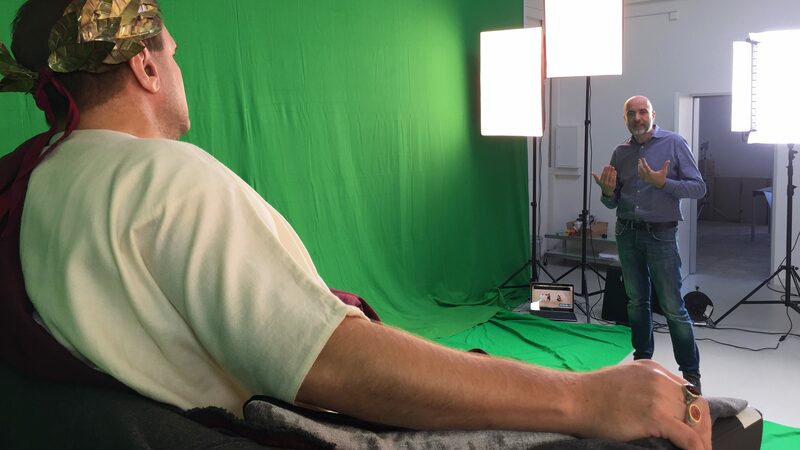 A seamless, portable greenscreen was required for the background: four by twelve meters wide, and erected in a half-circle. A second important shooting took place in the studio at home. 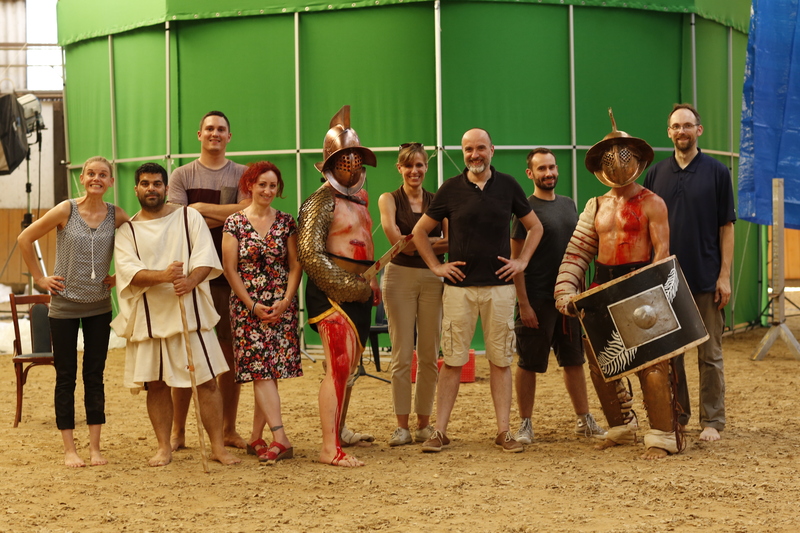 While the gladiators presented the challenge of a very intimate camera distance and rapid movements, the sheer number of people involved in the studio shooting and their precise positioning made this an entirely different ball game. Nearly every single person in the shoot was filmed individually: each of them had very specific markings on the ground which dictated where they needed to stand in order to create a flawless mirror to the digital scene. Laszlo Kish was a fabulous impersonator of Emperor Titus. His scene required one long two minute shot, but even after many repeated takes, he never lost his cool. During his way to the railing of the emperor’s loge where his performance ended, he had to be precise down to a few centimeters in order to get as close to the viewer as possible. In the final compositing process both the digital and live footage was finally combined. 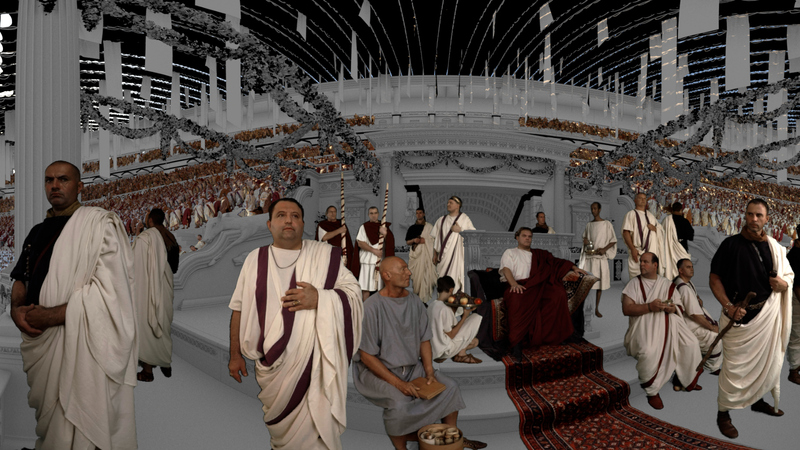 The living, spatially accurate filmed actors where placed into the finalized digital reconstruction of the Colosseum as individual film plates.